The WKO4 development team has been hard at work, and we are now in the final beta phase of WKO4 for PC release. Full launch of WKO4 for PC was scheduled for year-end release, unfortunately we have made the difficult decision to delay the release while making final improvements. As we approach the full release, our primary goal is that all users have a great experience using WKO4 for PC. Our beta testing group (currently full) has been running for several weeks during which we are making final improvements to the user interface and user experience. Over the next few years, WKO4 will be the tip of the spear of our product line, and the way we introduce many new training science, metrics, and performance tracking ideas, so it’s important that the foundation is sound. 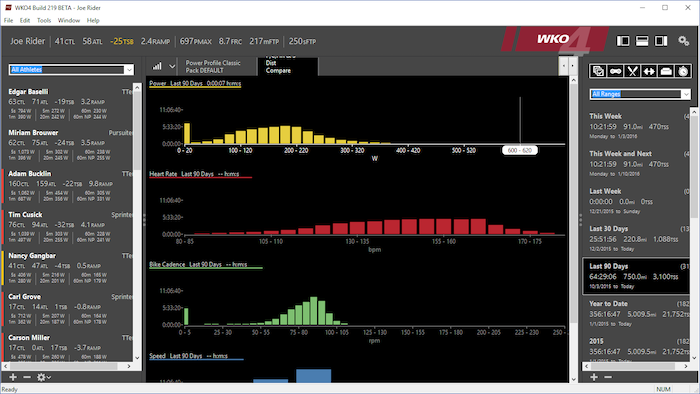 Going forward, we’ll focus on making “actionable intelligence” so you can fine-tune your fitness and take action with specific guidance from WKO4. Thanks for your patience and understanding as we work hard to make WKO4 for PC as good as we, and you, have come to expect. For the latest updates, follow the WKO4 Facebook Page.